A small Islamic monastery, also known as zawiya, in southeastern Turkey dating back to the 12th century was relocated Monday to a new site to prevent it from flooding when a new dam opens. 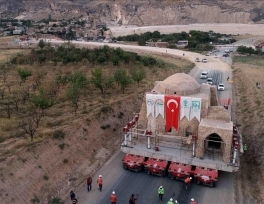 A 256-wheeler flatbed truck moved the shrine part of the 850-ton ancient Artuqid-era religious school for one-and-a-half hours, to a cultural park in the district of Hasankeyf in the Batman province. The first part of the zawiya was carried some 2.4 kilometers away from its original spot. 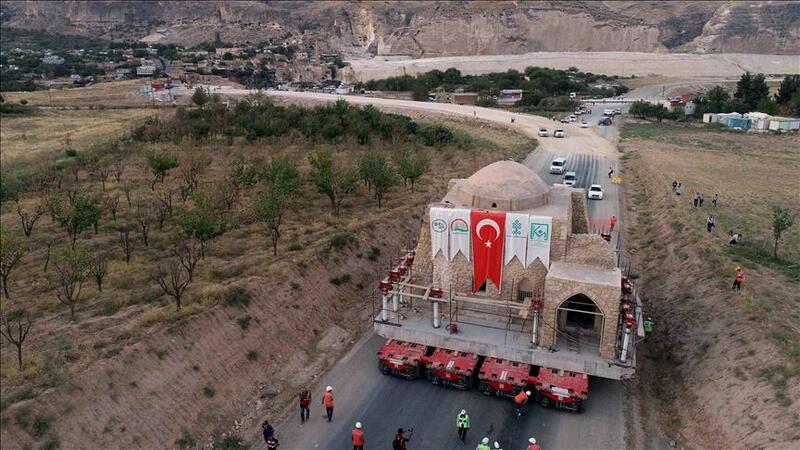 The relocation of the ancient structure followed the move of 540-year-old Zeynel Bey Shrine and a 13th-century Turkish bath, or hammam, in the same ancient district of Hasankeyf. The minaret part of the zawiya is expected to be relocated during the week. Speaking to reporters, Murat Dagdeviren, deputy director-general of State Hydraulic Works (DSI) termed the relocation of the zawiya “historic”. Dagdeviren said the relocation of the zawiya was more critical than the previous ones due to some asymmetrical features on the structure. “We need to do more sensitive transportation,” he added. The zawiya was reconstructed to adapt to the Ayyubids era, while it was also restored in the Ottoman and Republic eras. Hasankeyf, 32 kilometers (20 miles) southeast of the provincial capital Batman, was declared a conservation area in 1981.